In yesterday’s post I was rushing through Ballymacarrett along the Comber Greenway. Today I’ve reached Ballymacarrett Intake. Why do we have two townlands called Ballymacarrett? According to the PLACENAMESNI website, yesterday’s townland of Ballymacarrett is the original one. Today’s townland of Ballymacarrett Intake was built on land reclaimed from Belfast Lough, and was only designated as a townland in the 1901 Census. The Intake is the 14th and final townland on the Comber Greenway, which has given me an interesting walk through “seven miles of traffic free tranquility” from my starting point in Ballyloughan townland. 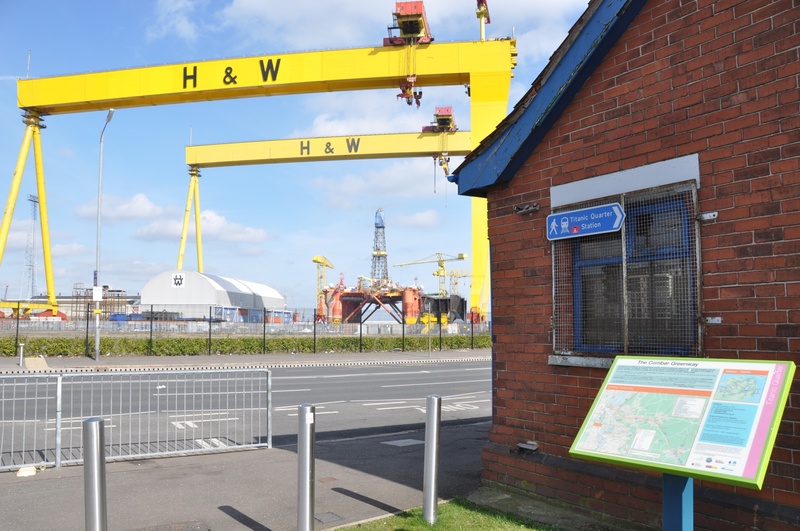 The western end of the Greenway on Sydenham Road offers a good view of Belfast’s shipyard cranes. 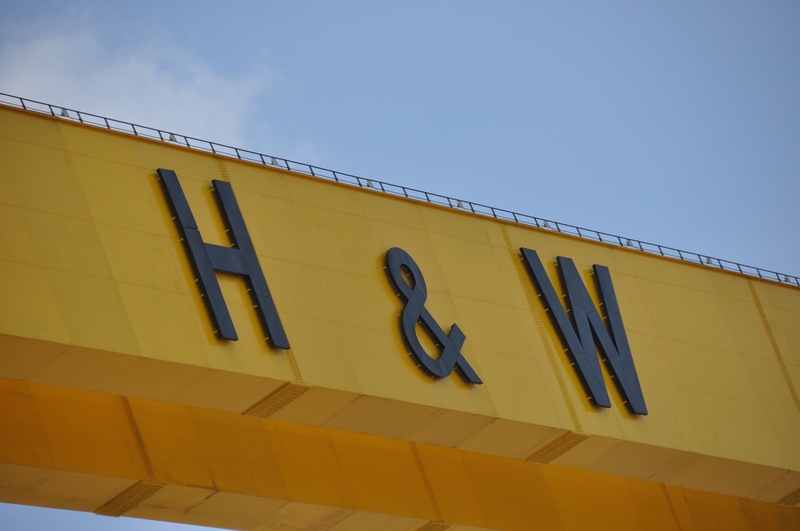 The initials on the crane gantries stand for Harland & Wolff. The shipyard was founded in 1861 by James Harland and Gustav Wolff, and is most famous for building RMS Titanic. After a period of government ownership from the 1970s to the 1990s, it is now a subsidiary of Fred Olsen Energy. 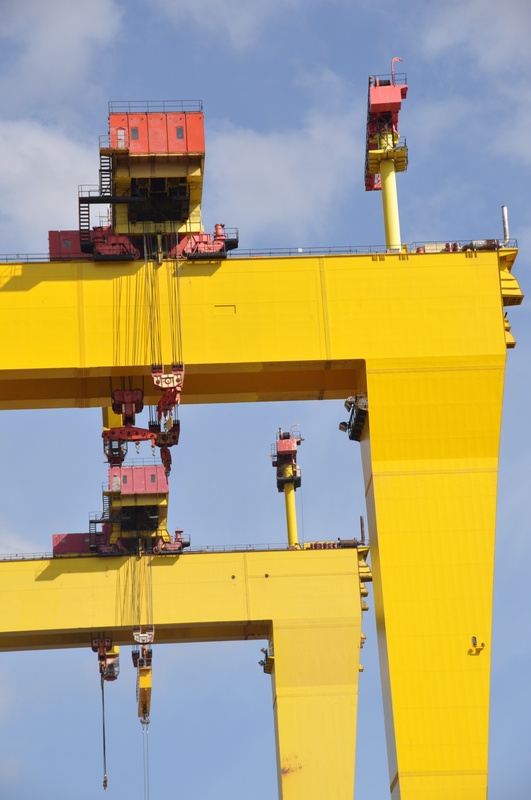 As I mentioned in yesterday’s post, the taller crane is known as Samson, the smaller as Goliath. Below the cranes is a large dry dock. 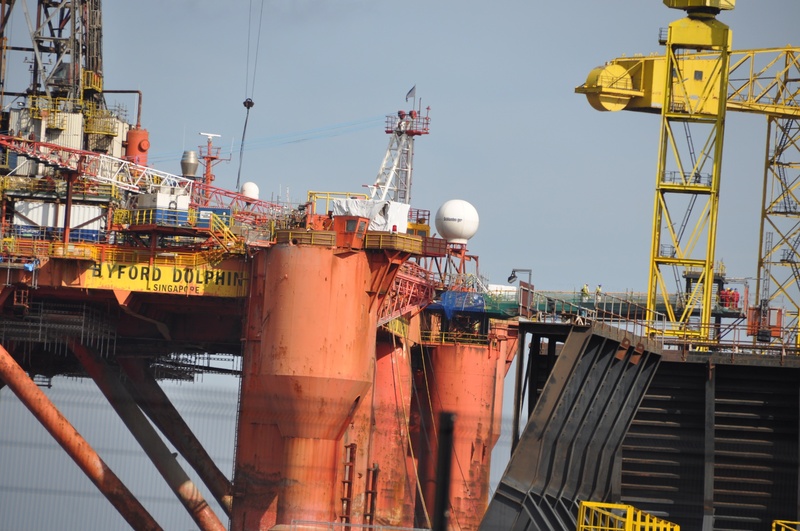 Harland & Wolff has not actually built any ships for the past decade, but work continues on other engineering projects, such as renewal and maintenance of oil rigs. The next photo was taken in March 2015. This whole area of Belfast is known as the Titanic Quarter. 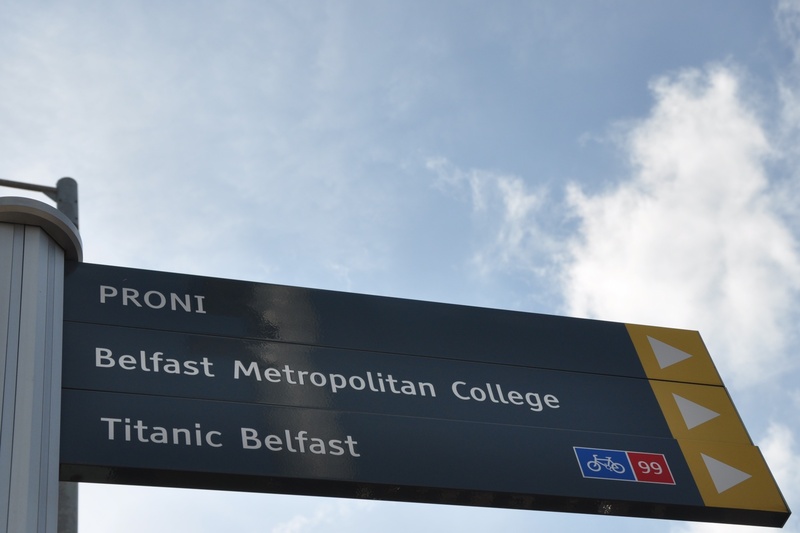 To find out more about RMS Titanic and the history of shipbuilding in Belfast, go to “Titanic Belfast” in the next townland to the northwest, Queen’s Island. But Ballymacarrett Intake is the right townland for other historical research at the Public Record Office of Northern Ireland (PRONI). 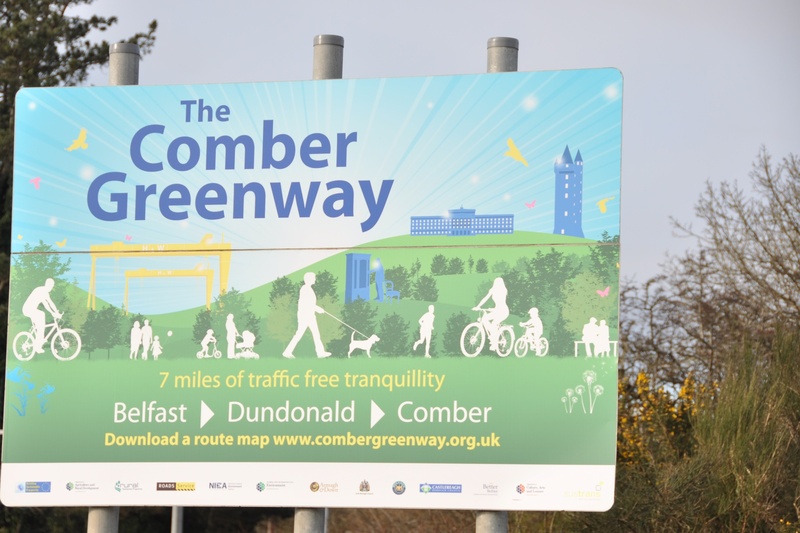 If the maritime city is not for you, and you are nostalgic for the Comber Greenway already, then you can head in the opposite direction towards the eastern boundary of the townland and the Connswater Community Greenway. I will write more about that when I reach the townland of Victoria Park. Which townlands border Ballymacarrett Intake? To the west, Queen’s Island. To the east, Victoria Park. To the south, Ballymacarret. Click here to see a map of Ballymacarrett Intake on Townlands.IE.